No.1 vs. No.2 player of the world and of the main draw meets each other, only third times since 1996 but every time, Djokovic was one of the participant! In the H2H record, still Federer has a slight lead by 21-20 before his 42nd matchup which put them on the second position in the Open-era . . .
Former doubles partners and room-mates, teammates, lifetime friends and the kindest players of the tour: Flavia Pennetta and Roberta Vinci has already guaranteed that the 2015 US Open Women’s singles champion will be an Italian lady! First time in the tournament history. The Swiss No. 1 against the Swiss No. 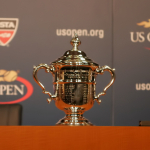 2, Federer – Wawrinka matchup, first time at US Open. Although on the rank list, the Italian lady is far behind her Romanian player, however Flavia leads the H2H contest against Halep. Last time they met on hard court at Grand Slam, it happened in 2008 when Nole beat Marin in 4 sets here in New York. Serena Williams is chasing history to complete her first Calendar Grand Slam. Roberta Vinci is bidding for her first ever Major final. In the H2H, the American leads 4-0 against the Italian doubles specialist. It will be the 129th Wimbledon Championships of all-time (2nd most of all-time) and the 48thin the Open-era (most in the Open-era tied with French Open). You can read some miscellaneous stats about BIG4’s chances, the British and US players, the tiebreakers and some other interesting topics. It will be the 114th French Open of All-time. It will be the 48th French Open in the Open era. 1. RAFAEL NADAL – THE WOUNDED BULL IS THE MOST DANGEROUS?! MISC FOR MEN’S SINGLES SFs: Berdych – Murray This is the FIRST time when a Czech (or former Czechoslovakian) player will face a British player in the Semifinal in the history of Australian Championships. This is the 3rd meeting between a Czech (or former Czechoslovakian) player and a British player in a semifinal in the . . .